Amiens defender Prince Desir Gouano, centre, points at supporters after hearing racists insults on Friday. 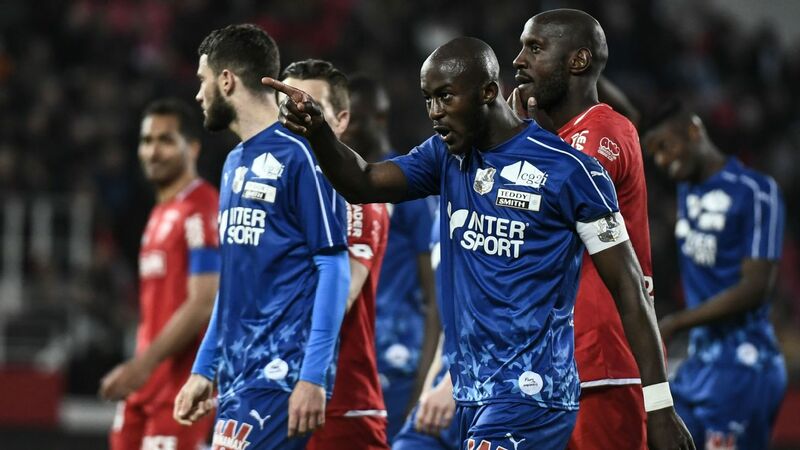 Dijon's Ligue 1 game against visiting Amiens was interrupted for five minutes on Friday when the teams stopped playing after French defender Prince Gouano was subjected to alleged racist abuse. "We are in the 21st century, what happened is unacceptable," Amiens' Gouano said on beIN Sports. "I wanted to make a point when I asked to stop play. We are all equal." The French League (LFP) said in a statement that Dijon had identified a man who abused Gouano and that he had been arrested. Mario Balotelli scored again as Marseille beat Amiens 2-0 to move up to fourth place in Ligue 1. Balotelli, who joined Marseille on a free transfer from Nice last month having not found the back of the net all season, had come off the bench to score on his debut in a 2-1 defeat to Lille three weeks ago and bagged another in midweek as Marseille won at Dijon. Paris Saint-Germain bounced back from their shock elimination in the League Cup by thrashing 10-man Amiens 3-0 in Ligue 1 on Saturday. PSG, who lost 2-1 to En Avant Guingamp in the League Cup quarterfinals on Wednesday, struggled in the first half as they were without Neymar, rested by coach Thomas Tuchel. Edinson Cavani, Kylian Mbappé and Marquinhos were on the scoresheet for PSG, helping the league leaders to a comfortable 0-3 win at Amiens.